I always appreciate maps when reading about tactical maneuvers. This book had one map. I read this book in a couple of days as it was a very easy read. Comprises of quotes from those who were there, blended in, mainly, chronological order re-telling the story of the Falklands Conflict from pre to post invasion. 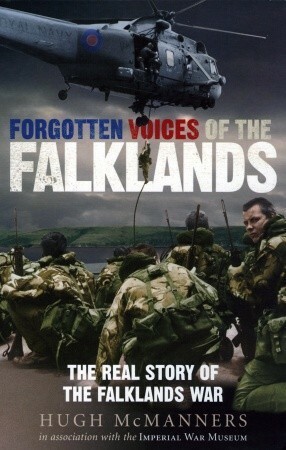 Quotes from many sources including senior UK military, those that were there, islanders, Argentina military and civil service.Strengths - first hand accounts are enlightening, often laced with heartfelt opinion, giving a feeling of a true account of what went on.Weaknesses - Possibly slightly unbalanced. Those that come in for most criticism (Adm Woodward, Hermes, Welsh Guards, 5 brigade) have no say. Not sure if this is because no-one wanted to comment or no-one was given opportunity to set the record straight. Excellent.A sad reminder of Britains solo war against the Argentinians. Hugh McManners - After 18 years in the British Army including serving in the Falklands War with the SBS, Hugh became a non-fiction author and television producer. He was the Defence Correspondent of The Sunday Times from 1995 -2000. As well as writing books, Hugh is the Director of The Scars of War Foundation at the University of Oxford, a pioneering medical research team examining the cognitive neuroscience of combat-related PTSD and brain injury in war veterans. Hugh says: "I'm a campaigner and enthusiast; and try to be entertaining with it. Having written a wide variety of non-fiction books, I'm now having a go at fiction - a "military historical thriller" about the Falklands War of 1982. Publishers always want to know "which bookstore shelf will this occupy?" So I hope this is actually a genre. But on the other hand, one of my earlier non-fiction books "The Scars of War" didn't fit a genre (of that time), and didn't matter. I was then pleased to see other authors writing similar books. "Psychological military reality" would describe it but is perhaps too much of a mouthful? For me, books about military subjects must above all considerations be absolutely true to the brave people who risk life and limb for our security. This is why I'm starting an "Authentic Military Books" shelf on my GB profile. I'll add all the ones I come across that ring true to my experience. It does seem that some authors - especially of thrillers, appear not to understand military life. Unless you've lived it, how could you - no matter how good a writer you might be?And actually, I dislike this word 'Thrill". It's a type of entertainment, describing a superficial experience while warm and comfy in a very safe place. This is not the reality of military operations So I'm not quite sure where that gets me with writing "thrillers"! Suffice to say that my first one is entertaining with plenty of action. I'll leave further comment to my readers once it's published - early next year. So watch this space! !